I can finally say I made it to one of my top bucket list locations –The Maldives. It completely lived up to every single one of my expectations and more. Staying in an overwater bungalow complete with an infinity pool, surrounded by blue and turquoise waters each morning was absolutely blissful and felt like a complete dream. The COMO Maalifushi was the most luxurious place I have ever had the pleasure of staying and I wanted to share my experience with you below. The location itself is perfection. The only resort in the Thaa Atoll, it’s a one hour seaplane flight to the resort, with the most splendid views of The Maldives and their atolls the entire ride from Male Airport. 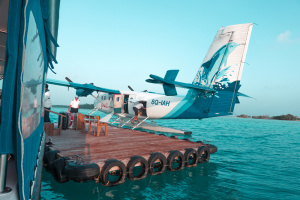 Most resorts in the Maldives have a transfer process as there are more than 2,000 islands and they are all spread apart but I loved the touch of flying into the resort by seaplane. The island itself is private and intimate, which I liked as it felt even more exclusive. On arrival you are greeted by welcoming staff, handed a coconut and steered into a buggy and whisked off to your room. I stayed in a water suite with a private pool. I loved the magnanimous size of the place and the thoughtful layout. There was not one thing I could fault. I arrived at sunset, so stepping outside onto the dock and watching the sun go down blew me away and left me with an incredible first impression. The outdoor area was my favorite with it’s own deck and lounge area, infinity pool, outdoor shower and steps leading down from behind the pool into the ocean. Step back inside through french doors and you have your beautiful white canopy bed, walk-in wardrobe, vanity mirror and bathroom complete with a sunken marble spa tub. The living room has a lounge for relaxing and looked out on the wondrous view. I loved that I could open the french doors the entire way, turn up the music and enjoy my surroundings. I loved feeling undisturbed the entire trip. I never once walked in to staff cleaning my room however when I did have a request the staff were speedy, helpful and accommodating. Como has mastered the art of leaving you to you to your own devices unless you request otherwise. Drones are banned on the island, so there’s no chance of someone flying a camera over your villa! The resort is extremely quiet. The buggies are only permitted to drop off luggage and guests on arrival and otherwise bikes are the only transportation around near the accommodation. There are also no motorized water sports to wake you up. 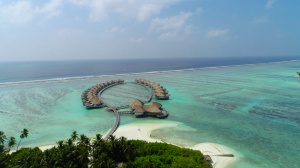 So if you are looking for a quiet and tranquil place to unwind, you have found it at COMO Maalifushi. Being such an exclusive resort, bike riding is the quickest way to get to where you want to go. Not only is it great exercise and peaceful but you discover some of the most beautiful spots around the island when you explore. I loved the restaurant Fashala, which was located at the peak of the island and had beautiful views of the water as we feasted on their incredible food. 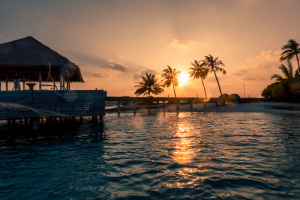 Other spots included stumbling across a swing overlooking the waters and the golf course with incredible views of the ocean, where you find the highest point in the Maldives “The Summit” at a towering 12 feet! COMO Maalifushi is covered in reefs and is a fantastic place to snorkel. Just walking or riding along the docks I had the pleasure of seeing octopus, reef sharks, crabs and colorful fish. They also have an incredible experience of night snorkeling with whale sharks when they are spotted nearby. I would love to go back for that experience alone. I was lucky enough to go on a Turtle Quest, where I was taken out on a yacht and dove into deep waters to snorkel, dive and search for green turtles. 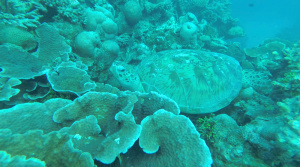 The instructor knew where they would be hiding and we saw between 7-10 huge turtles that day. It was an experience I will not forget. 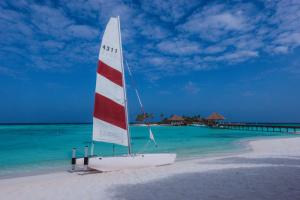 The resort is a great place for the more adventurous to try out some water sports. 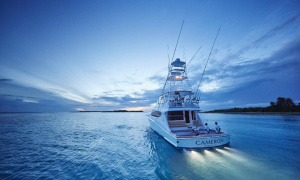 From kayaks to sailing a catamaran, they have it all! I was taught by the lovely water sports staff how to captain a catamaran. I was taught all the basics before we sailed off and I had an absolute blast. As you sail deeper and further from the resort the water changes from a light turquoise to a deep blue. The day I chose the wind was just gusty enough to pick up some real speed, so it was quite an adventure! The staff are great teachers and made the experience super enjoyable. COMO runs two complimentary yoga classes a day. One in the morning between 8 and 9 and one in the evening between 5 and 6. If the wind is fairly mild, you are lucky enough to have yoga on their decks overlooking the ocean. You don’t get more zen than that! Como is known for its health and wellness focus. Why not have an invigorating spa treatment with ocean views in one of their five carefully crafted rooms. I loved the touch of the Como Shambhala Tea prior to my treatment. It’s a combination of ginger, honey and lemon that was divine and encourages even more relaxation. All the food on the island is fresh and exquisite. 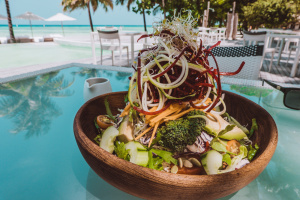 From healthy choices of smoothies and juices in the morning combined with an incredibly extensive menu and buffet, to the Como Cuisine lunch and numerous choices for dinner. Using locally sourced ingredients the Como Cuisine has a health focus that the owner is passionate about. The thing I loved the most is you can taste the freshness, as most of their vegetables are sourced directly from the properties gardens. Finally the ultimate luxury experience… Embark on a sightseeing cruise on Como’s luxury yacht – The Cameron, complete with dolphin spotting! We chose to go late in the afternoon so we ended the day with a beautiful Maldives sunset. This happened to be the last day of my trip and finished my stay off beautifully. 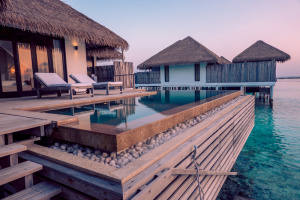 I hope I have helped provide some insight to how incredible a holiday can be at COMO Maalifushi in The Maldives! If you have any questions please comment below and make sure to follow me on my Instagram (@elise_natalie) to see where I go next!